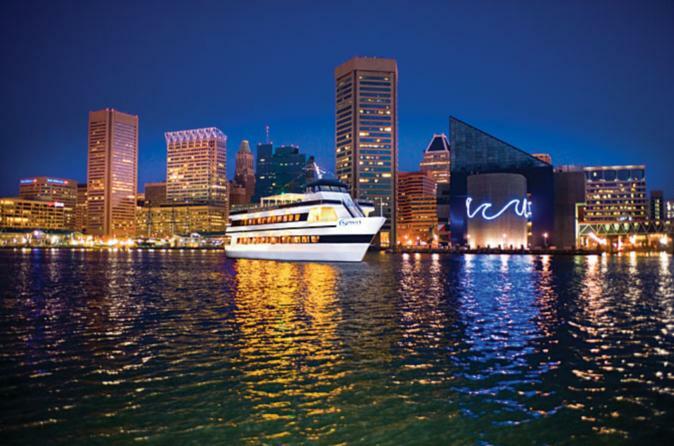 Celebrate your romantic Valentine's Day in Baltimore with dinner, dancing and sightseeing aboard a three-hour luxury cruise on the Inner Harbor. Glimpse top Baltimore attractions like the Francis Scott Key Bridge, Maryland Science Center and Pride Mast Memorial, while you dine on a lavish, all-you-can-eat buffet! See spectacular views and the dazzling city lights of Baltimore's skyline as you are entertained by the ship's singing staff and a live DJ spinning your favorite songs. Stunning skyline views, inspired cuisine and an experience unlike any other all make for the perfect celebration of love. Your most memorable Valentine’s Day yet is waiting on the water, when you and your sweetheart join us aboard Spirit of Baltimore! This dinner cruise on Baltimore's Inner Harbor is a fun and entertaining way to see some of the city's famous and historic landmarks. Enjoy the views from the deck of a sleek, sophisticated cruiser as downtown Baltimore lights up when the sun sets. As you travel from the Inner Harbor to the Patapsco River, you’ll be treated to a sumptuous all-you-can-eat buffet, complete with a carving station. As you enjoy your meal in the elegant setting of the ship’s dining room, you’ll be entertained by the colorful characters of the ship’s cabaret. After dinner, the dance floor heats up as a DJ spins the hottest Top 40 songs for nearly two hours. When you've had your fill of dancing, grab your drink and relax on a large outside deck. You’ll be enchanted by the nighttime backdrop of the illuminated Baltimore skyline -- so remember to bring your camera! This three-hour dinner cruise is an excellent prelude to your date night!